Have you been turned down for a MasterCard credit card. 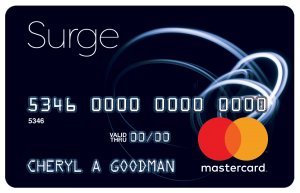 Now with the Surge MasterCard credit card you may never be overlooked again. Some traditional credit card issuers may turn down having to approve someone with past credit problems. That is why you need a credit card from the Continental Finance Company. This company was founded in 2005 and is one of Americas largest servicers of credit cards for consumers with less-than-perfect credit. Use where MasterCard is accepted.